The University of Texas System invites nominations and applications for the position of President of The University of Texas at El Paso, a national model for creating and successfully executing highly competitive academic and research programs while maintaining a deep commitment to serving a 21st century student demographic. UTEP officially opened in the fall of 1914 and is the second oldest institution in The University of Texas System. It is a Carnegie high-research-activity, urban university that enrolls more than 25,000 students. It serves its primary constituency — residents of far west Texas, southern New Mexico, and northern Mexico — with 74 undergraduate programs, 74 master’s programs and 22 doctoral degree programs, including a growing portfolio of online degrees. With an 80 percent Hispanic student population, UTEP proudly reflects the demographic composition of the bi-national region from which it draws the vast majority of its students. Eighty-three percent of students are from El Paso County and 4 percent are Mexican nationals. UTEP is one of the few doctoral/research universities in the United States with a majority Mexican-American student population. Set against the backdrop of the Franklin Mountains in the Chihuahuan Desert, UTEP is an urban university located at the heart of the U.S.-Mexico border in a growing community of more than 840,000. Together with Juárez, Mexico, it is one of the world’s largest bi-national metropolitan areas, totaling more than 2 million residents. UTEP – with its annual budget of $500 million, a University-related local economic impact of $1.4 billion, and its cultural, arts, continuing education and athletic programs – is a major contributor to the region’s prosperity and quality of life. UTEP’s unique architectural style was inspired by buildings in the Himalayan Kingdom of Bhutan. The 420-acre campus is bustling with growth, including the recent completion of a number of significant construction and renovation projects including new state-of-the-art facilities in chemistry, computer science, engineering, health sciences and nursing, and a major pedestrian-friendly transformation of the campus core. As Chief Executive Officer of UTEP, the President has the responsibility of articulating the mission and values of the University. A comprehensive position specification document can be found here. 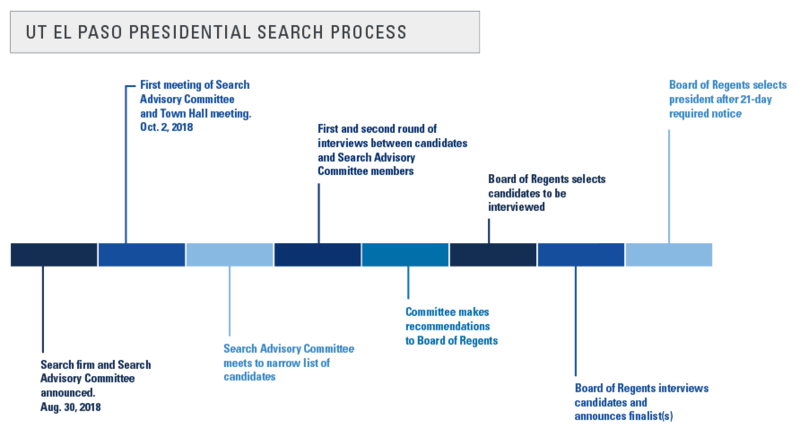 Committee members were selected in accordance with the Board of Regents’ Rules and Regulations, which include a provision for representation on such committees by various constituencies of the institution.